Leg is a crucial of our body part. It used to be walk, run, and stand. It supported our activity especially like move. 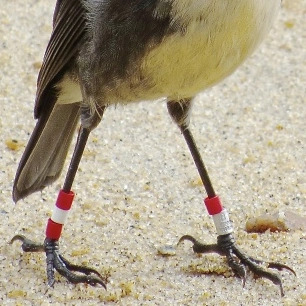 So does bird, leg also used to support their activity such like move, perch, grab the prey, or to build the nest. They should be ruined if the legs disfunction such like broke. There are so many causes of broken legs in bird. Actually, broken legs in bird isn’t far different with chicken leg problem but still there is some different between it. Different with chicken who automatically paralyze when they got some problems of their legs, bird usually can still stand up properly but lifted their food as commonly. That’s because basically they can fly. They don’t use their leg as common as chicken who basically living in the land. So broken leg on bird usually unknown because the symptom which appeared not that crucial enough to make you sure that there are some problem with the legs. To make sure that your bird is not going well, you can touch their leg directly. If the leg is right broken, there are usually small bump that you can feel when you touched. As first aid you can install the prop to minimalize the risk. Even this first aid is so helpful for the bird, you must extra careful when apply it because small mistake will make the leg broken perfectly and can’t be restore. Different the symptom are also different caused. Here are some major causes of broken legs in bird. Hard treatment. If you are bird farmer which usually need for manage them quickly honestly or not, you may treat your bird hardly. By this hard treatment, you may don’t know that the fact you are breaking their leg. When you move them and their leg touched the cage, it may strangulated between it. You never know because you just focus for the speed. And is the bird owner can’t do the same? Well both people who pet a bird as livestock or just general animal pet has same risk to hurt the bird by the hard treatment. But highly opportunity placed to bird farmer because they forced to done some task as soon as possible. Besides, bird owner usually not pet bird on much population so you can take the conclusion. Sharp cage. The thing that usually didn’t watch both of pet owners and bird farmer is the cage. The texture of the cage must be smooth so the bird wouldn’t get hurt. As we know that cage usually made of wire or bamboo. Both wire and bamboo has their own risk, moreover if you made it by yourself usually you aren’t surely watch over the detail like end of the wire which too sharp. So does bamboo which has harsh texture if you forget to squish it. The big ware or big bamboo that used for cages are also increase the opportunity to broken their leg. You better use medium or small size to use for the cage material. Place much bird in one cage. On livestock industry, place much bird in one cage is general thing that we usually met. To pressed their budget place much bird in one cage whereas it would make they are pile up each other and broken their leg. Disease. Well if you feel there is no lack on your treatment and the tools, broken leg also caused by disease. Lack of nutrition also caused your bird so weak and so easy to broken their leg. Some disease that caused by virus or bacteria can also weak the legs. Felt. Well may be this point is like joke but even bird can fly they can also felt too. When they lose control on wildlife they would be felt and broken. So does when they are in the cage. When you felt the cage, your bird will felt too and hit the base. That hit will absolutely break their leg. Fight. Broken leg on bird can also cause by fight. When they living on wildlife to hunt to earn their food, they usually fight face some predators to get the food. During fight, bird usually got injured and broken. Stressed. Bird can also feel stressed. If they can’t adapt well with their new environment, they would stress that represented by their behave which hurt themself such like pull out their own feathers, or fly randomly and crash themself. It also broken their leg unconsciously. Always be careful. When you treat your bird, make sure that everything is doing well, Stay focus and careful included when you move and choose the cage material. Make sure that it is bird friendly. Don’t move your bird or the cage hardly to avoid hit that can broke their leg or another body. And the matter thing is keep the environment is friendly over your bird because their broken leg also caused by stressed. Getting used and keep interaction commonly would help them feel safe and comfy. Supplement. Giving extra supplement over your bird also useful to help them for keep their health bone. Beside to keep the healthy bone, supplement also help to balance their nutrition needed. So using supplement you can get double advantage, healthy bone and nutrition balancer. Giving supplement isn’t enough without healthy food for your bird. It must be balance between food and supplement. Because the main needed of all creatures is food so you better fulfill their food and after that try to balance their nutrition by using supplement. Sun bathing. Birds are so relatable with sun bathing. Every morning you suggested to dries it out under the sunlight. Beside it useful to kill bacteria or drying their feather after bath, the sunlight which contained much of vitamin D is very useful for keep their bone health. Vitamin D also used for rebuild the phosphor which may broke inside them.